Ducati’s presence in World Superbike racing, where the racebikes are based on their road-going siblings, has been dominant to the point where fans have oft informally referred to the Championship as The Ducati Cup. That success can be attributed to the otherworldly talents of legends such as Polen, Fogarty, Bayliss and several others, but undeniably they had the right machine to ride at the right time. Carlos Checa, Ducati’s most recent champion, took his title in 2011 on the excellent 1198 R. This year, he is racing the newly homologated 1199 Panigale. Homologation is where the factory manufactures at least a set minimum number of machines for sale to the public, and they are then allowed to campaign that model in the World Championship. 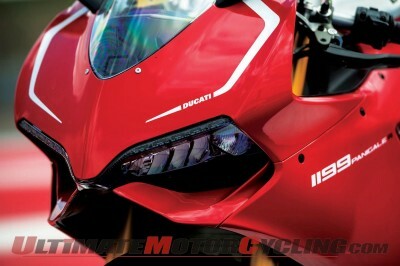 The Panigale – named after Ducati’s hometown of Borgo Panigale – was a radical machine when it debuted last year. A stunning tribute to the amazingly innovative factory, its combination of the frameless carbon sub-structure concept, electronically adjustable Ohlins suspension, and the most-powerful-ever 1198cc Desmodromic L-twin engine, created some slack-jawed expressions around the paddock as competitors realized what they would soon be up against. Initial tests proved that the Panigale S worked well. Therefore, the race version – the Panigale R – would presumably only require that Ducati swap on some race bodywork and wait for the green flag – except that simply is not in Ducati’s DNA. Refusing to rest on their considerable laurels the engineers spent a year further developing the Panigale into a better track weapon. They then unleashed it on the world’s press, and emphasized the point by doing it at America’s newest premier racetrack – the Circuit of the Americas (COTA), just outside Austin, Texas, which was designed for Formula 1 and MotoGP racing. On paper, the changes to create the Panigale R seem like mere tweaks, as they are essentially limited to some weight savings and helping the handling a little. However, the changes have had a profoundly positive effect on the real-world ability of the motorcycle. The most important change is to the Superquadro engine’s internals, and a significant three pounds have been saved. Titanium con-rods and diamond-like carbon-coated rocker arms, as well as a lighter crankshaft and flywheel, enable the Panigale R motor to spin up and down much more rapidly. This enabled Ducati to raise the rev ceiling by 500 rpm to 12,000. The lighter engine mechanicals and re-mapped ride-by-wire fueling (retro-fitting is available to 2012 models) have resulted in a noticeably stronger mid-range‚Äîthe only real criticism of the earlier version. Outright maximum power is unchanged – a mind-warping 195 horsepower at 10,750 rpm (the fitting of the included racing exhaust boosts that to 201 horsepower) and an incredible 98 ft/lbs torque at 9000 rpm. Crucially, the changes allow the Ducati to run a lower final drive gearing of 15/41 that increases acceleration without compromising top speed. It is noticeable how much stronger the R pulls off the corners; torque is increased by between 10-and 18-percent, depending on which gear the bike is in. I could hold gears longer through COTA’s technical sections without having to scramble for the next ratio while leaned over at speed. Circuit of the Americas was designed by Hermann Tilke, primarily for Formula 1 racing. Of all places for Ducati to launch their flagship, this was a very brave choice; if there were any flaws in the Panigale R, COTA would find them instantly. Of the 20 turns, three are very slow hairpins that follow high-speed sections. A couple of MotoGP teams had been testing at COTA the week prior to the launch, and every rider later commented on how technically challenging the track was. Over several days, test times dropped by around eight seconds, illustrating that intimate track knowledge is key to going fast at COTA. Although an F1 car can carry huge corner speed, motorcycles are very different. Transitions from high-speed to slow and back up to high-speed, are a huge challenge to man and machine. To have such enormous, yet linear, power was a definite advantage accelerating out of the slow corners, especially while I was trying to learn the highly technical track. In the longer turns, such as Turn 10, I discovered that I could hold 3rd for longer (at over 100 mph) instead of having to short-shift into 4th. This resulted in a better drive on the exit, and kept the Panigale chassis more stable through the corner. Likewise, in the final sequence of Turns 16, 17 and 18, which are taken as one long, sweeping double-apex corner‚ I could hold 3rd all the way through without the engine running out of puff halfway around. My performance during the first few laps of COTA was close to abysmal. The rapid changes of direction, the variety of lines, blind, high-speed corner entries, and the huge speed differentials, had me in the wrong gear much of the time. The reason I admit to this is to illustrate how impressive I found the Ducati’s low-rpm power to be. Several times I was far too slow in a corner, and in too high of a gear, yet the Panigale R pulled strongly and efficiently from what seemed like idle; the bike made up for a lot of my own shortcomings. The changes to the motor and fueling have noticeably filled in the mid-range lull in power that was so noticeable on the R’s predecessor. Accelerating out of the slow final Turn 20 and on to the front straight is a grin-inducing affair. With such a huge amount of easily delivered torque, the front wheel would lift lazily off the tarmac and hold through the next gear, before returning smoothly to earth after I changed up into 4th. Incidentally, the quickshifter attached to the Panigale’s lever is a joy to use, with perfect interruption intervals between gears. Naturally, the Panigale R comes with several carbon fiber accoutrements, including both fenders, inner fairing panels, and several smaller items. Combined with the gorgeous Marchesini forged aluminum wheels, wet weight is quoted at a feathery 417 pounds, and you can feel it. The Panigale is quite tall to sit astride, though once aboard it felt small and almost too slim until I became used to it. If you are used to Japanese liter-bikes, the Panigale is a very different experience, indeed. The beautifully sculpted gas tank is so skinny at the rear, gripping it under hard braking was a little challenging at first. After some acclimation, the ergonomics are superb and the Panigale is surprisingly comfortable for such a committed superbike. Detail touches on the R include machined mirror caps, a taller windshield with superior aerodynamics, improved seat fabric for better grip, and a Termignoni racing exhaust system. The instrument pod can be set either for automatic lap times, using an onboard GPS sensor, or for a conventional street readout in either mph or km/h. Much has been made – both good and bad – of Ducati’s weight-saving frameless concept, where the traditional (and much beloved) trellis steel frame is replaced by carbon components that attach to the engine and support the various suspension, foot controls, and sub-frame pieces necessary to accommodate a rider. Although the motorcycle feels very stiff in a way that similar Japanese machines do not, the Panigale’s handling was exemplary, and feedback from the front-end was completely normal. The sheer stiffness of the chassis actually helped me feel the suspension working, and enabled me to easily identify the small adjustments needed to make it even better. For example, running through the blind sequence of Turns 2 through 5, speed builds enough that Turn 5 – a decreasing radius corner – comes up rapidly. This requires full confidence in the front and an ability to pull the bike back to the apex if you judged the entrance slightly wrong (which I frequently did). The Pirelli Supercorsa SP tires deserve much of the credit here, of course, and they work in concert with the Panigale R’s superb chassis, which gave me supreme confidence on a highly technical, very fast track that I had never ridden. The R features an adjustable swingarm pivot that can be raised by as much as two millimeters, and lowered by as much as four. Lowering the pivot point increases squat at the rear. This decreases agility while it improves traction and feeling, especially in low-grip conditions. During my first session on the Panigale R, it felt a little too soft at the rear. Coming through the fast Turn 2, the rear tire would wriggle somewhat when accelerating hard on the straight; upon landing a wheelie, the handlebars would shake a little. Raising the swingarm pivot to the +2 position made a dramatic change in the Panigale’s behavior. Not only did the rear end issues go away, but it also became much more focused at the front end and turned quicker and more precisely into the slow corners. Apparently, I’m in good company, as this is the setting preferred in general by Carlos Checa, though I‚Äôm sure his preference will vary from track-to-track and with changing conditions. Electronics are the Panigale’s middle name and a mind-boggling variety of settings can be changed at the touch of a handlebar button. Fortunately, the factory default riding modes cover the bases well, and include three ride-by-wire fuel maps, eight levels of traction control, three levels of engine braking, and three levels of Bosch ABS modulating the superlative Brembo Monobloc M50 brake calipers. The suspension preload and damping is adjusted by electric servo and there are some 180 combinations, should you decide to stray from Ducati’s defaults. There’s something about that Italian Racing Red that gets the blood pumping. Ducati has the shade just right, and they have the class to minimize the graphical treatments and grace the Panigale with true elegance. If just the 1199’s looks get your heart racing, then wait until you sit aboard one of these exquisite animals and feel the motor thump into life. Add the spice of sitting in the pit lane at the new Circuit of the Americas, and clearly the lightning is about to escape the bottle. Astride the slim-waisted and compact new Ducati Superbike 1199 Panigale R, it feels light as heck and it exudes the sort of animal grace and simultaneous power I imagine you would feel sitting on a jungle cat. It is slightly intimidating, but in contrast to a wild animal, Ducati has sanitized the Panigale’s prodigious horsepower with an unrivalled electronics package and sweet handling chassis that does everything right. Time will tell how the 2013 World Superbike Championship will play out for Carlos Checa and his Panigale R. Having set pole position in its debut at Phillip Island, things look very promising, indeed. This story is featured in the May/June 2013 issue of Ultimate MotorCycling magazine — available on newsstands and good bookstores everywhere. The issue is also available free to readers on Apple Newsstand (for iOS devices) and Google Play (Android).